Odissi dance is from the state of Orissa, situated in the mid-northeastern coast of India. It is one of the most picturesque and historically rich regions in our country. With its rivers and luxuriant vegetation, hills and forests and many magnificent ancient monuments and temples, it presents a picture of all the essentials that are required for lovers of both Nature and the Arts. The ancient Jain rock-cut temples of Khandagiri and Udaygiri are notable for their fine friezes and bas-reliefs, many representing the dance; the great temples of Bhubhaneswar, especially the Rajarani and Venkateswar temples, the Puri Jaganath temple, as well as the Nat Mandapa of the Sun Temple oft Konark with their high ornate towers and beautifully carved, ornamental halls and courtyards are perfect examples of how they were not only religious centers, but also centers of culture and art. Both music and dance became closely connected with the rituals and worship. Orissi dance in fact has been preserved by the temples themselves because they have brought to posterity thousands of examples in sculptures that are a prolific orientation of the techniques of Odissi dance. Vatsaya, an eminent scholar of Indian Dance, affirms that Odissi may well claim to be the earliest classical Indian dance style on the basis of archaeological evidence, the most outstanding being the Rani Gumpha caves of the 2nd century BC in Orrisa. Scholars have dated the caves and the carvings to be earlier than the writings of Natyashashtras. It is interesting to note that the Natyashshtras took cognizance of the style of dances depicted in these caves. It mentions of the existence of a dance style called the Odhra Magadha style, the precursor of present Orissi style. The dance remained an oral tradition through the beginning of the 20th century, in possession of semi -literates who were not aware of the Sanskrit texts on dance. They were performed by women (Maharis) whether in court or temple and it is clear from the inscriptions and literatures that with the establishment of the great Shiva temples at Bhubhaneswar, these ladies were encouraged to reserve the classical dance right from the 7th century AD. Around the 7th century, the Vishnu temple of Jagannath at Puri, also introduced this institution of temple dancers. Dance halls (called "Natya Mandapa), were attached to these places of worship, and particularly at Konark, dance performances took place, with all the grace, technical brilliance and atmosphere of devotion and honor. And we hear of girls of good family including royalty such as Chandrika Devi taking dance as an honorable profession. Around the 1600 AD, male dancers dressed as females, known as Gotipuas, gained prominence. The dances were passed down, in the case of Maharis (female temple dancers) from mother to adopted daughter, and in the case of Gotipuas, from teacher to the dedicated boys. Dance by Maharis was totally stopped in the temple of Jagannath after independence due to the opprobrium attached to the female dancers, although the singing continues to this day. Lack of patronage made it difficult to continue the Gotipua dance tradition in the temples of Orissa, and financial duress drove the young Gotipuas to jatras or roving theatre- drama groups. Orissi this way began to loose some of its spiritual quality. Orissi was revived in post-independent India, as a neo-classical form, by a group of scholars and dance practitioners and teachers, who formed the group known as Jayantika. It was Indrani Rahman, who was the first dancer to present Odissi abroad, and placed it on the dance map of the world. Orissi the classical style of today in India, has developed from the Gotipua repertoire, rather than the Mahari and overcoming all growing pains, it has finally taken India's dance stage today by storm. It is amazing that though regionally varied, they are unified based on the ancient Classical treatise called Natyasastra, the oldest surviving text on stagecraft in the world, which coverscovering virtually every aspect of stagecraft, written many centuries ago between 200 AD and 200 BC by a sage called Bharat Muni. Though some scholars think that it might have been written by more than one author at different times, yet it is unanimously believed that it is based on the long obsolete treatise called Natya Sutra. In the ancient times, Indian Dance had a universal appeal throughout India, like all civilizations east or west. It was more than an expression of physical or emotional exuberance, something more than a form of entertainment. It provided a major source of religious education for the people. Indian dance is considered one of the 64 types of art (KALA VIDYA) of which music, cooking, jewelry-making, makeup, painting, needlework, archery, floral decoration, are few common ones. The Natya Sashtra was regarded as the Fifth Veda. The first four Vedas were meant exclusively for the uppercaste people, but the Natya Veda provided divine experiences for the entire society through dance and dramatics. Hindu religious mythological legends abound with themes of dancing. As classical dancing moved from ritual to a secular environment and from entertainment to a refined type of aesthetic performance, the role of women dancers changed in a revolutionary way. There are some unique features that make this dance style so beautiful and graceful. 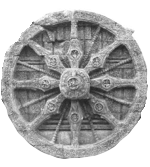 In technique it followers the basic rules of Natyashastra and the Silpasastras. The most important element is the Bhangi (stylized poses) and Karanas (yoga based positions). It treats the human body in term of the three bhangis along with the deflections of the head, torso and hips- hip and head on one side and the torso on the other and the principle of shifting unequal division of weight from one foot to the other. There is also the Chouka, in which the feet are positioned to form a square position and where the weight of the body is equally divided with a small distance between the two feet. Different types of walking - chalis or gatis are derived from the Natyasastras. Bramaris or pirouettes are also common, both clockwise and anti-clockwise. A hand movement such as the dola hasta, a relaxed hand movement gives Odissi dance its beauty and grace. Besides Sitting postures (baithas), Sthankas (standing postures), walking (Burhas), jumps (Uthas), different ways of retreating from the stage (pallis), shifting of weight by swaying the body from one side to another (bhasa) are important techniques which makes this dance style so unique. Lastly the Padabheda of Odissi dance is not only the movement of the feet but of the whole leg. Toe heel contacts are common, for example, kunchita when toe touches the ground and anchita when ankle stamps the ground. One movement of Anchita foot is Gotti or Begini, and another is Dhanupada where the leg is lifted to touch the ear. Orissi in accordance with the Natya Sashtra rules contains three main elements of classical dance, perfectly compounded, namely: Bhava (mood), Raga (melody/song), Tal (rhythmic timing), as well as Natya, which entails the combination of both acting and dancing. In Orissi dance style, we see Nritta (foot steps and body gestures devoid of emotions and concentrating only on rhythms and beats called layas or talas) and Nritya (combination of rhythms and bhavas or feelings). In Orrisi, the invocation dance is called MANGALACHARAN and pays homage to earth, stage (ranga-bhumi), the audience, and above all to almighty. The rhythmic dance of Odissi is called BATU/STHAYI (foundation) and PALLAVI (flowering, which is a fast paced dance with intense footworks –heartbeat of the mother earth-where the dancer and the percussion instrument are competing with each other). There is also the dance called MOKSHA (Liberation), and the acting dances are called ABHINAYA, immortalized in the lyrics of the poet Jayadev of 12th century. We also see in Orissi style what the Natya Sashtra defines as masculine and feminine forms called, Tandava and Lasya. Orissi also uses Mudras or hand gestures, such as matsya- for fish, pakshi- for bird, mriga- for deer, sharpa- for snake etc. Most importantly Orissi depicts quite effectively the Navarasas of Natya Sashtra, which are the nine emotions of human beings--Sringar (love), Hasya (laughter), Karun (sadness), Roudra (anger), Veer (valor), Bhayanak (fear), Vibhatsa (disgust), and Adhbut (astonishment).